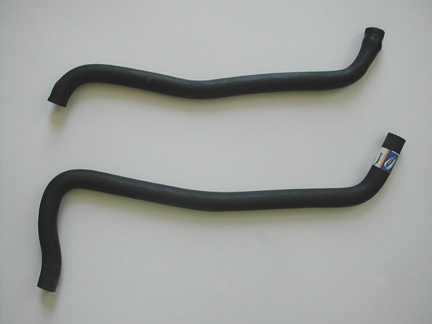 I was in urgent need of replacement of the crankcase breather hose on my 98EV. The hose I used was Dayco #80404. It's intended purpose was as a coolant hose, so I can give no promises on how it will hold up to oil. Therefore use at own risk. However one has been on my EV for over the last 10,000 miles and appears ok. I run with Mobil 1 15/50. Some stats taken with a caliper that has seen its better days. Guzzi hose ID 12mm, OD 23mm wall thickness 4mm - Dayco hose ID 10mm, OD 20mm, wall thickness 5mm. It will need to be trimmed on both ends. One trimmed it will fit the crucial bend under the frame and the other end is left long enough to gently bend to the crankcase. Cost was $8.97. See a comparo picture HERE. This hose was used in an urgent situation and probably should be noted for this. I replaced this particular hose after 10-12000 miles due to it starting to look poor, very soft and starting to swell. I have received several emails from those unhappy that this $4.00 coolant hose may not be up to their expectations of the $30 + special grade factory hose. Cut the hose at the exact position as stock. Installation is similar to a chimpanzee mating ritual. Passionate and violent... but it's a perfect fit. Pre-stretch the ends and use a lubricant such as water for installation.